After a user clicks the icon to launch an app, your company sponsored launch image displays while the app loads. As readers flip through each page of Law Practice magazine, your ad will appear at the edge of the magazine, providing your company with exposure throughout the reader’s entire magazine experience. Advertising in the app is exclusive per issue. 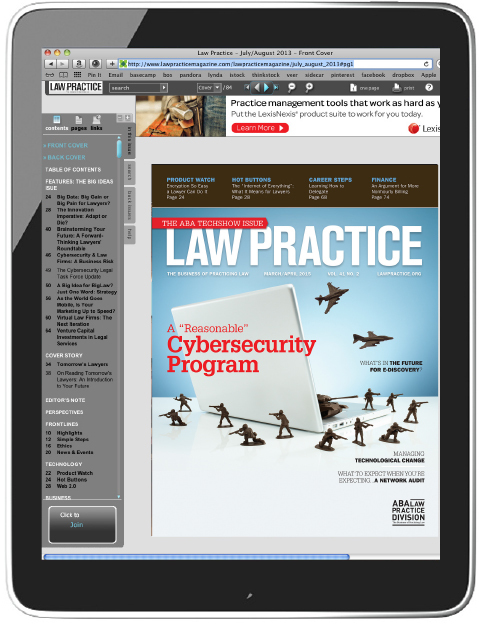 Law Practice is also available in the app store for individual subscription purposes and some issues may be open to the entire ABA membership. ABA frequently promotes the app to it's 400,000+ members and your company will benefit from being a part of the promotion as added value. Sponsors will also receive a mention in every issue in the print edition of Law Practice Magazine in the table of contents. Banner ads can be linked to a website, e-mail address, or to an app in the App Store. They can also be unlinked.